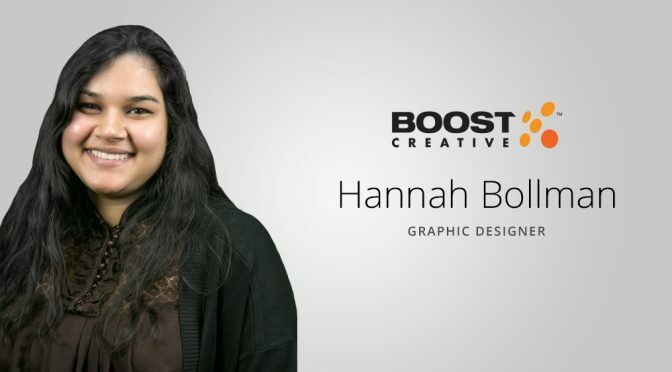 We are proud to announce our most recent addition to Boost Creative, Hannah Bollman! Hannah was born in Cuttack, India. Her short stay there lasted until she was adopted and brought to sunny Florida. Hannah has since lived in Florida and graduated high school in 2013. She went on to pursue her Bachelor in Fine Arts at Florida Atlantic University in Boca Raton. In school she designed logos and brand manuals for startup companies nearby. After graduating she moved back to southwest Florida to begin her career and was lucky enough to find Boost. She is happy to be working alongside fellow creatives and is eager to learn everything she can. In her spare time she enjoys gaming, writing and reading. She also has an interest in miniatures and unresolved mysteries.